When AMD first dreamed up the Zen core architecture they did it to disrupt the datacenter platforms and they new they needed a 32-core processor to do that. AMD came up with a new architecture from the ground up and that would be AMD’s new EPYC server chip (previously codenamed Naples). AMD EPYC hopes to chisel some market share away from Intel, who currently has 99% of this market. AMD has an uphill battle to overcome Intel’s dominance, but it looks like they have an impressive new X86 server processor that stands to get them back into the game. AMD’s timing to get back into datacenters couldn’t have come at a better time as many corporations are facing big workloads with virtual functions. Older processors have a hard time with artificial intelligence applications and the need to bring some new hardware into the datacenter is growing daily. 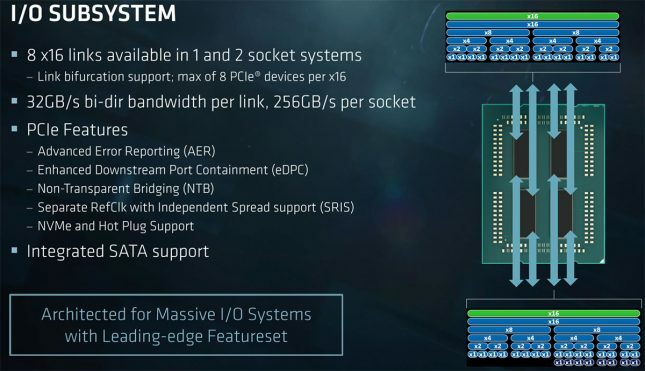 AMD EPYC processors have up to 32 cores and 64 threads on a single socket (1P) and on dual-socket (2P) server platforms you are looking at 64 cores and 128 threads. When it comes to Each EPYC processor have an unprecedented 128 PCIe Gen 3 lanes for some amazing I/O configurations. 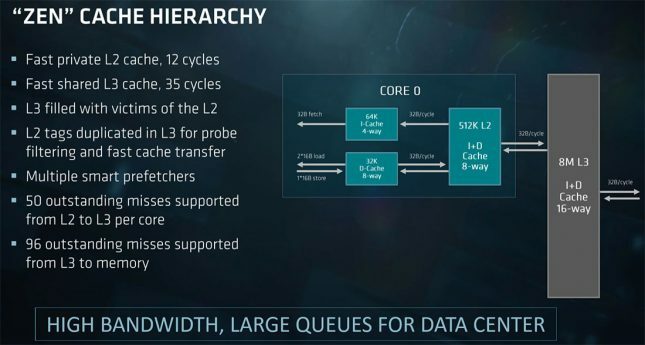 This is more than double the PCIe Gen 3 lanes that Intel can offer, so it is clear that AMD was going big with EPYC. AMD wanted to competitive with Intel when it came to total cores, memory channels and PCIe lanes. 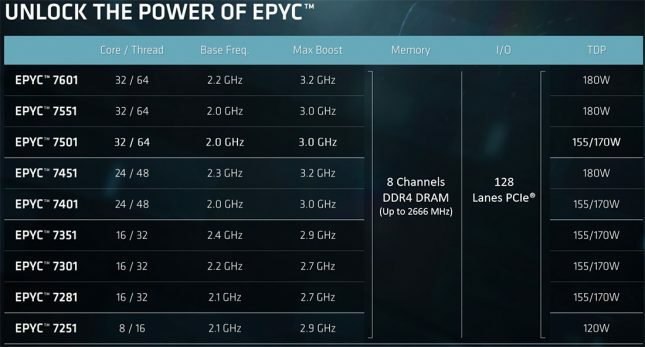 AMD will be releasing nine EPYC 7000 series processors in the weeks ahead and they will have 8, 16, 24 and 32 core configurations with speeds boosting up to 3.2GHz and a TDP of 180 Watts. AMD will be releasing the top half of the product lineup consisting of the 24- and 32-core processors immediately and then will follow that up by releasing the 8- and 16-core processors by the end of July 2017. The AMD EPYC 7601 is the flagship processor and it is a 32-core, 64-thread processor rated at 180 Watts with a 2.2GHz base clock and a 3.2GHz boost clock. That processor will cost around $4,200 each, but if you are willing to give up 200MHz you can get the AMD EPYC 7501 for $2,700 or greater. AMD is confident that the performance of EPYC processors will be up to snuff and shows a pair of EPYC 7601 processors performing 47% faster than the Intel Xeon ES-2699A v4 (22-core/44-core) processor that run $4,938.00 each. Not to be confused with the Intel Xeon ES-2699 V4 22-core processor that has slightly lower clock speeds that are $2,175 each (street price). Intel’s flagship model is using 145W TDP though versus the 180W TDP on AMD’s flagship EPYC processors. 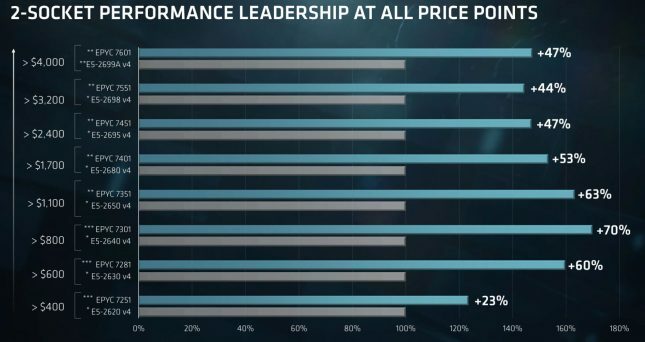 AMD provided the performance slide based on SPECint_rate_base2006 that we posted above to show just how disruptive in this market segment they think EPYC will be. Of the OEM servers that are built in the world today 25% have one socket populated. 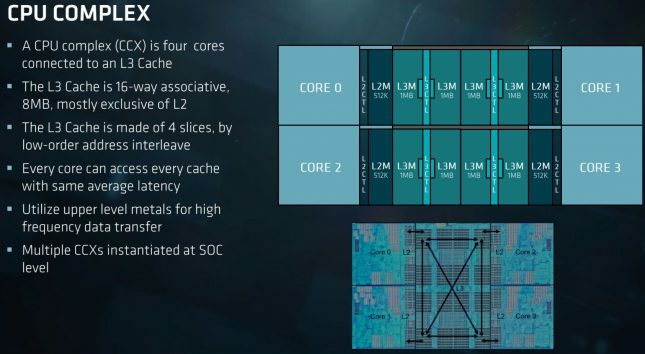 AMD sees that as wasted space and efficiency and they think EPYC is going to be able to dominate the 1S market. In fact, AMD believes that one of this processors could replace two mainstream Intel Xeon processors at the lower price points! 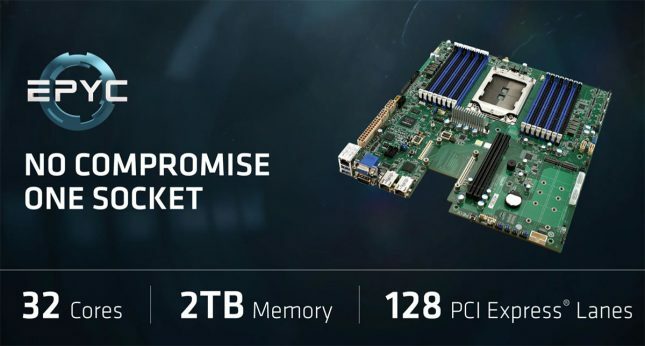 With one AMD EPYC socket delivering support for up to 32 cores, 2 TB of DDR4 memory and 128 PCI Express lanes it looks like AMD is trying to change the one socket market landscape! 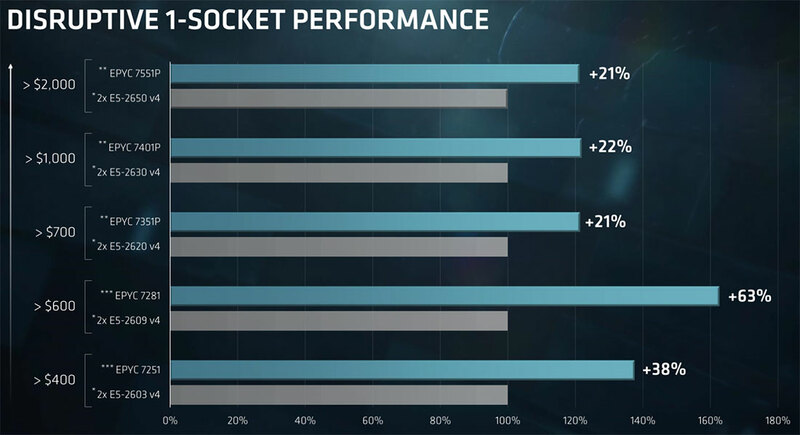 AMD will be releasing three processors that are only designed for 1-socket use to further capitalize on this segment. AMD EPYC is a Multi-Chip Module (MCM) processor and that was done to have a smaller die and better yield. The full featured processor has four CPU Complexes (CCX) that are built over AMD’s Infinity Fabric in order to have the lowest latencies possible on this architecture. AMD Infinity fabric is made of of two things; Scalable Control Fabric (SCF) that handles SoC and System level connectivity and control and then the Scalable Data Fabric (SDF) that handles all the memory requirements for each core. 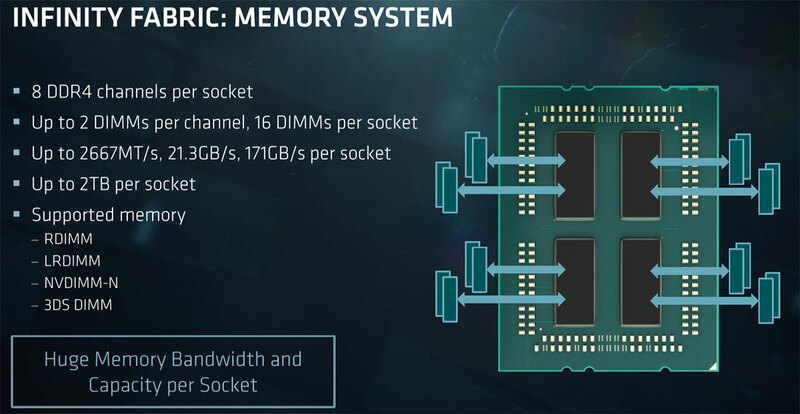 EPYC processors feature 8-channel DDR4 memory support and each socket supports 16 DIMMS of 2400MHz DDR4 memory. This is a first for the datacenter as Intel Skylake-EP feature 6-channel DDR4 memory support at the same clock speed. That means when it comes to memory bandwidth it looks like AMD is going to be dominant and that is important to organizations that run machine learning applications that love high memory bandwidth and lower latencies. Each CCX has two channels of memory connected to them and at 2667MHz you are looking at 21.3 GB/s of memory bandwidth per channel or 171 GB/s of memory bandwidth per socket! Factor in that each AMD EPYC processor supports of to 2TB of memory (RDIMM, LRDIMM, NVDIMM-N, 3DS DIMM) and you have one heck of a memory system. 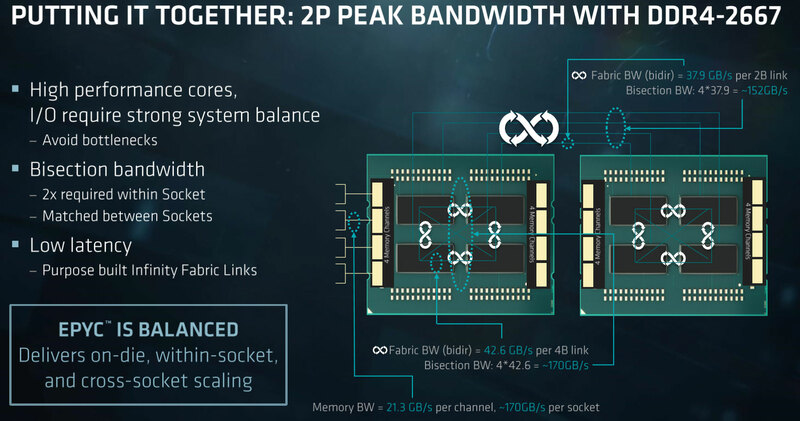 So, each EPYC processor can have up to 171 GB/s of memory bandwidth, but what about a 2P board? 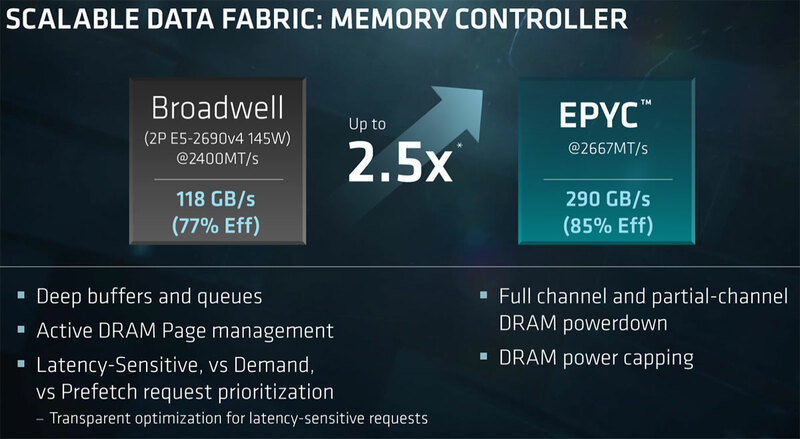 A pair of AMD EPYC processors have up to 290 GB/s memory bandwidth with 2667MT/s memory at 85% efficiency for a typical read/write scenario. Not bad and that is a ton of memory bandwidth! 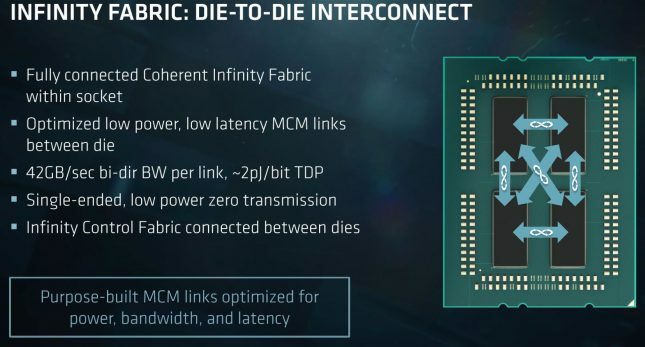 AMD EPYC processors might have an MCM style design, but the engineers designed it to be fully connected and they have 42GB/sec of bi-directional bandwidth between each CCX connection and there are six connections thanks to the Infinity Control Fabric. 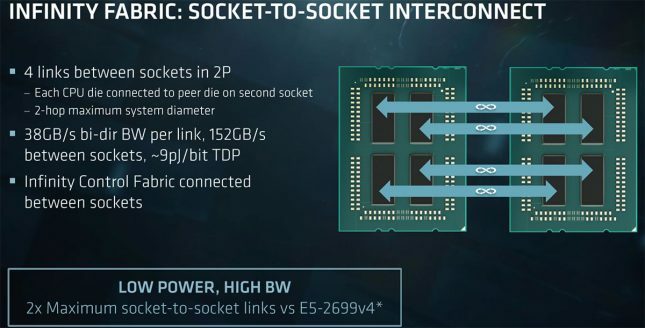 When it comes to socket-to-socket communication AMD went with 4 links between sockets in 2P configurations and each CPU die is connected to the peer die on the second socket. This means that just 2-hops are needed to communicate between chips. AMD is running 38GB/s bi-dir bandwidth for a total of 152GB/s data bandwidth between the sockets. This is twice the number of links than what Intel is running and AMD did this to help on NUMA applications. 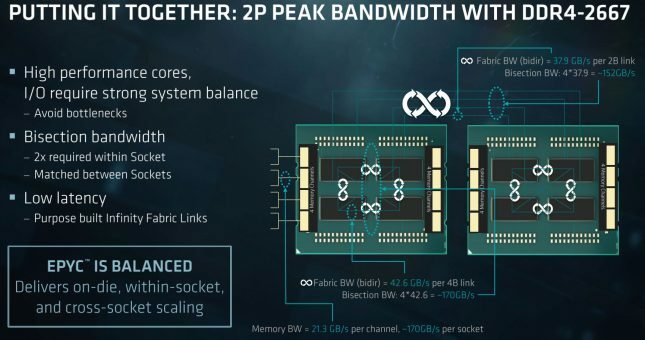 AMD has impressive bisection bandwidth between the two sockets and they need to since the data is being distributed between the two socket sub-system. Each AMD EPYC processor has 64MB of L3 cache that is 16-way associative and can be accessed quickly with a just 35 cycles. The L3 cache is also made up of 3 slices by low-order address interleave. 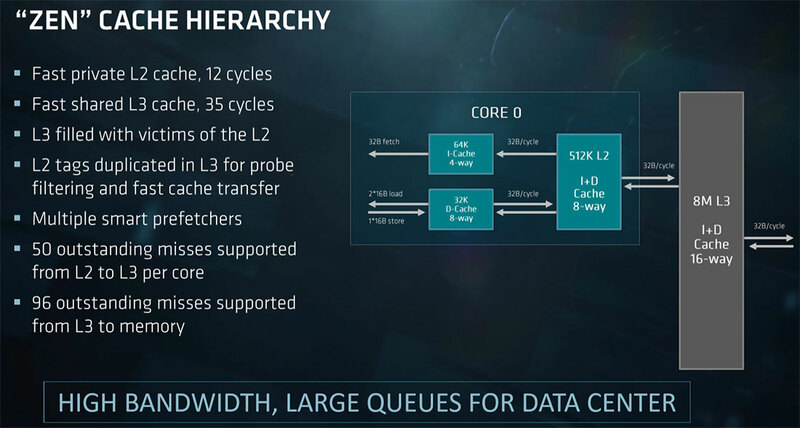 Ever core on the EPYC processor can access the L3 cache. The 128 PCIe lanes on AMD EPYC mean that you can have 8 x16 links available for board makers to design around. 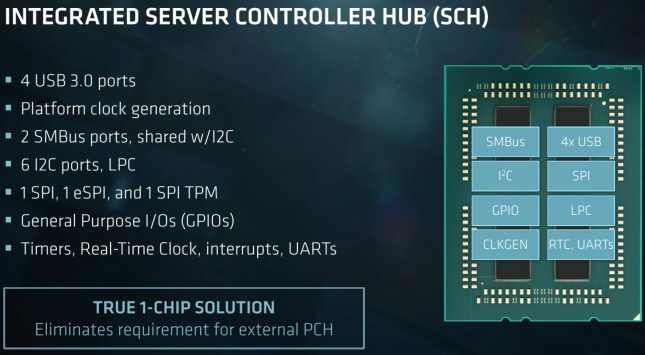 AMD allows for 8 devices to be connected per each x16 link grouping. With EPYC you have endless I/O solutions as you can have 32 PCIe x4 NVMe drives connected to one processor or 64 x2 slots for the ultimate cryptocurrency mining machine. You’d just need a massive rack to hold all the cards, ludicrously long x1 to x16 PCIe adapter modules and about a 8,000 Watt power supply if you had 64 cards running at around 150 Watts. You can’t run 128 x1 PCIe slots for some reason, but why would you need to? The AMD Integrated Server Controller Hub (SCH) supports four USB 3.0 ports, two SMB ports, 6 l2C ports and more. This allows AMD to have a single chip solution. So, the final take home message here is that AMD EPYC is a beast! A 2P system running DDR4 2666 MHz memory will give you a strong balanced system with what appears to be enough bandwidth for data to flow on-die, within the socket and between sockets. 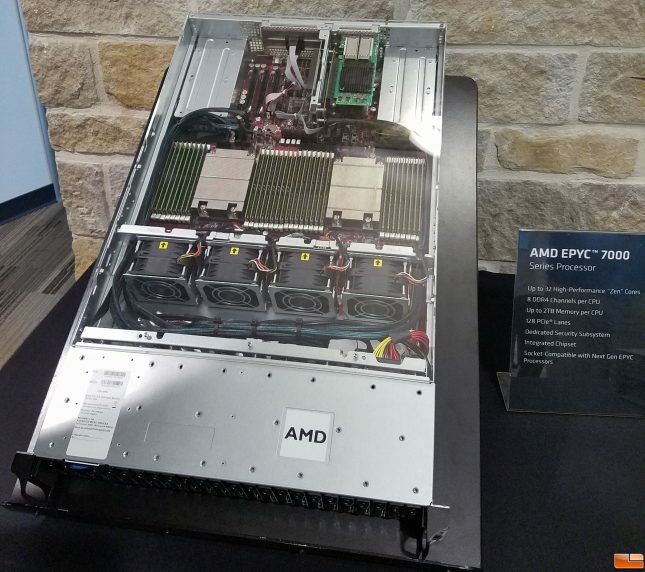 AMD is already working with ASUS, Gigabyte, Tyan, HEC, Inventec, Dell EMC, Microsoft, SuperMicro, HewlettPackard Enterprise and others to bring platforms to market for the AMD EPYC 7000 Series processor. Hopefully this momentum will continue as it looks like the EPYC 7000 Series processors can really bring good changes to the data center!